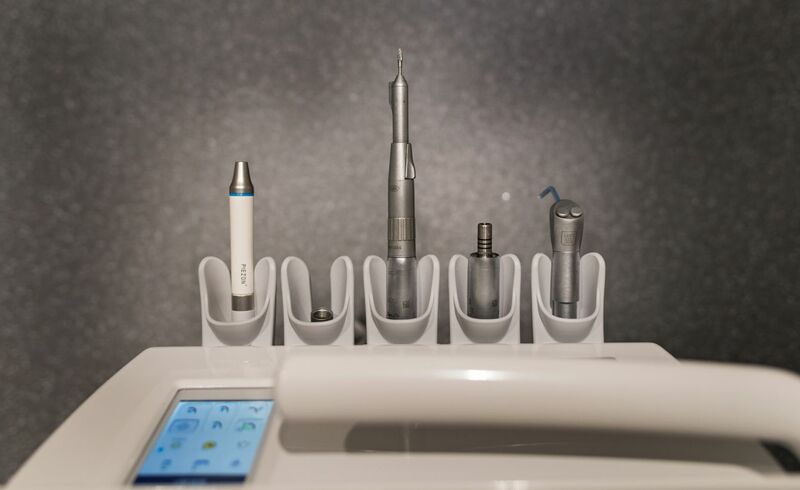 At Premium Dental Implants, we believe that providing our patients with the best care involves giving our skilled dental experts the very best tools. We are committed to providing the highest standards of clinical and patient care and continually invest in the best equipment available. The standard of our equipment and its maintenance all meet, and in most cases exceed national standards. In particular, our sterilisation facilities meet the gold standard recently set by the Department of Health. This has led to Premium Dental Implants being one of the ﬁrst dental practices in Wales to be awarded the British Dental Association’s Good Practice Award. We use only the best quality instruments to ensure the highest levels of treatment and eﬃcient service. For added comfort during your treatments, we have invested in the Rolls Royce of dental chairs. One of our latest investments has been a CT scanner which gives us a three-dimensional and a cross-sectional view of patient’s jaws. This enables us to select the best location for the implants and to plan surgery with pinpoint accuracy. All implants, sinus lifts and bone grafts are placed in accordance with The Royal College of Surgeons protocols. We use only the top-quality brands to ensure the highest possible success rates (over 96%). Implants that will last for many years, often for a lifetime. We use only the best Dental technicians to make or adjust dental appliances that are tailored to suit the patients’ needs.